Your chance to tee-off for the kids is coming up fast! That’s right – on July 12th, Dreams Take Flight will kick off their 9th annual Golf 4 Dreams fundraiser at Redwoods Golf Course in Langley with a Tailgate Lunch Party and a Shot-Gun Start at high noon. This empowering and engaging event, which Kihada Kreative has had the honour and pleasure of sponsoring since its very beginnings, is the ticket to a day in Disneyland for 125 kids facing physical, social, and mental challenges. Picture a round of golf on a course of lush tree-lined fairways, incredible live and silent auctions, contests, draws, and Redwoods’ famous steak and lobster barbecue dinner – all of which helps create magical memories for special kids! Your day on the green could help make dreams come true. Every year, Dreams Take Flight flies kids from all over Canada to Disneyland, the Happiest Place on Earth, where the magic is real and hardships are forgotten. This year’s will mark the 20th Anniversary flight, and in accompanying each trip thus far, we here at Kihada Kreative have witnessed the magic at work among the kids and their families. The brief reprieve from their ongoing struggles, in which kids can just be kids, leaves a lasting imprint that, we hope, remains a ray of hope for years to come. None of this would be possible, however, without the support of sponsors and fundraising events like Golf 4 Dreams! Generous greats like Kids’ Horizons Air Canada, 93.7 JRFM, Club Intrawest, 24H News, and BMW have helped Dreams Take Flight put together a fantastic day for your enjoyment in support of the upcoming flight. Each ticket includes a round of golf with shared power cart, Tailgate Lunch Party, an extra drink ticket, silent and live auctions, ongoing contests like the Longest Drive and Beat the Pro, goody bags and gifts, 50/50 draws and raffles, a sumptuous surf ‘n’ turf supper, and much more for only $180 – the price of the steak and lobster alone, in most fancy restaurants! Participants also get a chance to win two economy-class tickets to fly with Air Canada to any of their amazing destinations. Who knows – maybe your dreams will come true, too! 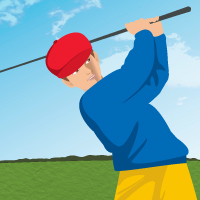 Here at Kihada Kreative, we can hardly wait for the annual tee-off. As part of our ongoing dedication to supporting Dreams Take Flight and its miraculous cause, we’ve created a brand new poster for the event, worthy of a 20th anniversary celebration. Our inspiration came from the vintage posters of the 1930’s-50’s, and the bold, cheerful colours of Dreams Take Flight’s logo. We left real-life behind and took to dream-like skies with a new series of custom-made illustrations. We also played with the texts, using bold headlines and a hierarchy of detail to paint a visual story. Our aim was to capture the magic and hope that blooms when Dreams Take Flight. To learn more about our involvement with Dreams Take Flight and other community initiatives, follow this link to our website. 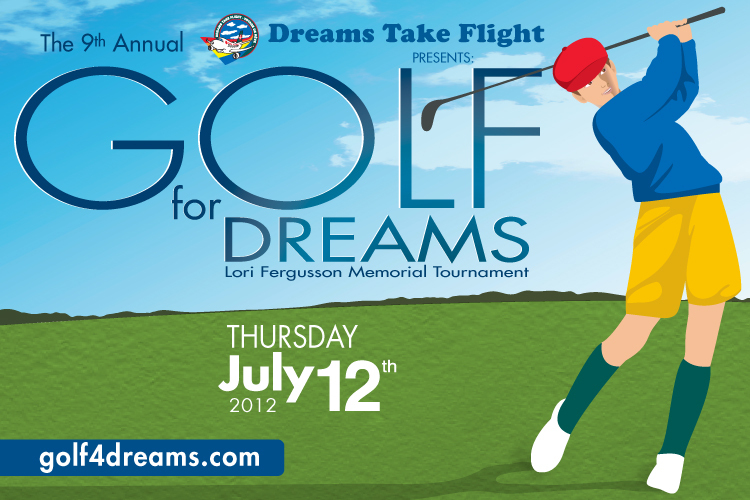 Click here for more information about Dreams Take Flight and Golf 4 Dreams; to purchase tickets, click here.